Whale shark watching is definitely a must when you are visiting Philippines. You can do it yourself or if you are travelling with your friends and family even better. Just be sure of one thing, that you visit them during the season they are in Sorsogon. To help you even better in preparing your match awaited encounter with the Butanding or gentle giants, here is a simple guide for you. Butanding season starts around November and goes on through month of May. The best month to see them is February through April. It is advisable to go in the morning, as the waters are clearer and it easier to spot the Whale Sharks. According to the locals, the Whale Sharks are also more abundant before noon. On peak season, it is very common for each visitor to see more than a dozen different Butanding. If you are coming from Manila there are two options in getting there. First is by airplane, about 45-50 minutes a short ride from Manila to Legaspi (your entry point in Bicol region). There are various airlines servicing this route with varied prices too. You can check on Philippines Airlines, Cebu Pacific or Zest Air. Upon arrival at Legaspi airport, there are Van drivers waiting for passengers there. The hotel you will be staying can book the transportation for you in advance. Or if not you can just find one there for sure. The trip is about an hour from Legaspi to Donsol, prices also varies. From Legaspi, you can make a short stop-over to marvel at the majestic Mayon Volcano either on your arrival or on you way back to Manila. Often in the Legaspi airport But if you are not press with time, would love to see the beautiful scenery of Luzon vegetation and is willing to take that long bus ride (about 15-18 hours depends on bus company), there are buses plying from Manila (EDSA, Pasay, Cubao) directly to Donsol,Sorsogon. Upon arrival at Donsol you must register that day (if you wish to do whale shark watching the next day) at the Donsol Tourism Office. You can take a tricycle going there or walk by the beach or along the road depending where your hotel is located. At the Tourism Office, you will be required to register and attend a brief orientation session prior to heading out to see the Whale Sharks. You will also be required to pay the fee for: Boat Rental and Crew, Registration, and snorkeling equipment rental (if needed). The maximum number of registrants per boat is 7 people. If you are travelling alone it is recommended that you find other visitors that can come with you on the boat to help you lessen the bill. There are always backpackers travelling alone so it won’t be such a hard task to do. Whale shark watching trips are often organized in the morning. They will advise you that the best time to leave is between 6-7 am. You can arrange to have a small breakfast by the beach in the hotel you are staying as you wait for your boat to arrive. 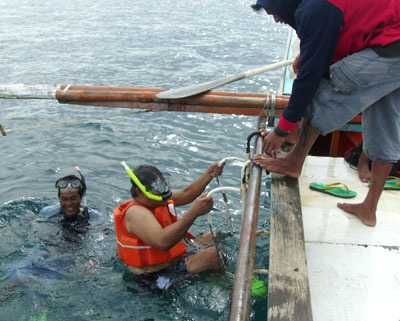 It is normally your BIO (Butanding Information Officer) that will welcome you on board the 12m (40 ft) boat. He will further explain you the rules and regulations and how the interaction normally occurs. There will be a spotter, the guy who is usually on the highest point of the boat to spot where the whale sharks are, and the rest of the crew. For a guaranteed safe and enjoyable trip it is advise to listen carefully your BIO. When a spotter sees one, he tells the BIO where it is, the BIO gives the signal position, and tells you to jump. 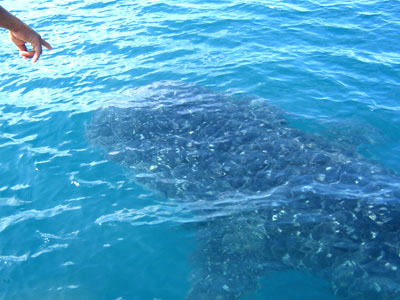 The BIO will swim and guide you to this once in a life time experience of whale shark watching. Generally, you do not need to be out in deep waters in order to interact with the Whale Sharks. Your BIO will point them out and educate you on how to spot them, as well as provide additional information you need to know during the experience. The BIO’s are quite knowledgeable and friendly, and are willing to answer your questions. When the BIO feels that the situation is ideal, he will instruct the crew on the boat’s approach to the whale shark, and take the lead in getting you ready for the experience. Seeing the Butanding for the first time is an extremely exciting experience. It is very important to keep the safety procedures in mind, and always follow the lead and instructions of your BIO. There are a lot of interesting places to stay in Donsol. There is Amor Farm Beach Resort, a great place with a beautiful garden and a great restaurant. There is also Vitton Beach, Woodland Resort and Casa Bianca. You can also do some homestaying in Donsol. How many whale sharks we can see in a trip? If you are lucky you can see as much as 12 Butanding in a day. But there is really no guarantee on how many you can see. How long the trip last? The trip normally lasts three hours. Do I need to be a good swimmer to do this activity? No. If you are a good swimmer it’s great but if you are not so comfortable in the water you can take some life jacket and your BIO will even assist you. What other activities we can do in Donsol? Aside from Butanding interaction you can also organize a “Firefly watching” with the tourism office. It is a night activity. I can answer your queries directly, email me at superkim18@yahoo.com. I live here, i grow up here, i work in the tourism business. i am qualified to answer your question lol. ty and see you guys here in donsol, “The Home of the Whaleshark”. I like to invite tourists from around the world to come and visit our Gentle Giants, the Whaleshark or Butanding in our dialect. Our Butanding interaction here in Donsol, Sorsogon, Philippines is dubbed as the, “Best Animal Encounter in Asia. I will make sure that everyone who will come and visit will left with a smile and excitement with their adventure here in the Philippines especially here in our town, Donsol, the home of the Whalesharks. You can watch some of my videos in the youtube with my Filipino and French guests. Hi, could you advise if my kid of 10 years old is allowed to this snorkel encounter with the Whale Shark? Will it be safe? Also what’s the average water temperature in April to May each year?